American classical guitarist Michael Lucarelli plays Franz Schubert’s “Ellens dritter Gesang” (“Ellens Gesang III”, D. 839, Op. 52, No. 6, 1825), in English: “Ellen’s Third Song”, commonly known as “Ave Maria” on classical guitar. Filmed at “the Cathedral of the Madeleine” in Salt Lake City Utah. The piece was composed in 1825 as part of his Opus 52, a setting of seven songs from Walter Scott’s popular epic poem The Lady of the Lake, loosely translated into German. It has become one of Schubert’s most popular works, recorded by a wide variety and large number of singers. 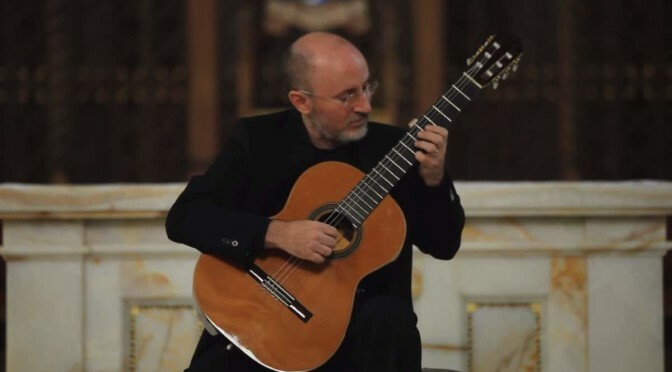 Born in Cincinnati, Ohio, Michael Lucarelli began his musical education on the electric guitar, but later discovered the acoustical guitar, and began his classical studies with Peruvian guitarist Ricardo Linares in Salt Lake City, Utah. He went on to receive his Bachelor of Music degree from The University of Utah, and in 1992, completed his Masters at The University of Arizona in guitar performance.